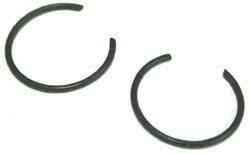 Includes piston, ring, circlips, pin & upper bearing. Click for part numbers. Includes piston, ring, bearing, pin & clips. Click for part numbers. The 2005 CR125 piston is domed and could be used as an RS125 piston alternative. Includes piston, ring, circlips, pin & upper bearing. Wiseco RS125 pistons are an excellent alternative to the factory HRC RS125 piston kits. Electra coated, improved pin bore wear and resistance to micro welding of the ring and ring groove. Complete with ring, two clips and wrist pin. Replacement ring for Wiseco CR125 & RS125 pistons. Fits the stock CR125 piston with a little filing at the dowel pin groove in the ring. Brand new, prepped by Swedetech Racing Engines. Power valves plugged & blended. In addition, the nut surface is spot faced for a flat surface to reduce the chance of stud failure. Cylinder head, Powervalve covers, hardware, gasket, piston kit not included. ONLY as shown in picture. Stock CR125 cylinder head studs. Sold individually. 5 required. 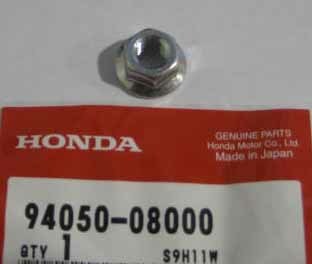 OEM Honda CR80 or CR125 "Flanged" cylinder head nut with 12mm hex. Sold individually. 5 required. OEM exhaust manifold nut. Sold individually. 3 required. OEM exhaust manifold stud. Sold individually. 3 required. Alignment dowel pins for the CR80 and CR125. Used to adjust Squish Clearance. These are stock plugs....not yet blended to match the exhaust port. Fits 97-99 CR125 cylinders. O-rings included. 2000 & 2001 Cylinder Power Valve Right Hand Cover finished in black anodize includes fasteners. Top performing, precision, investment cast power valve plugs for the 2001 CR125 cylinder are now available from SRS Engines. 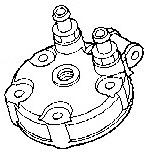 The shape of the exhaust duct in the 2001 cylinder is critical to power production. The stock 2001 power valve shape sacrifices peak power to give the engine a broad motocross power band that has good response as low as 6000 rpm. Since stock 125 shifter karts operate above11000 rpm most of the time, they can ignore low rpm power in trade for power gains above 11000 rpm. SRS has identified the duct shapes in the 2001 cylinder that give top level performance in the shifter kart rpm range. These shapes have been captured with computer solid modeling techniques and incorporated into the SRS 2001 CR125 power valve plugs. A precision investment casting process was used to preserve the shapes of the solid models with a high degree of accuracy in the production power valve plugs. When the plugs are installed in the cylinder and properly blended for smooth transitions between the cylinder and plugs, the maximum power potential of the stock 2001 cylinder can be achieved.